Gettysburg, Pa. (January 13, 2019) – OPEN MINDS has announced a highly anticipated executive summit, The OPEN MINDS Consumer Engagement Technologies Summit, will be held on June 6, 2019 from 9:00 am – 4:00 pm. During this summit, attendees will review the emerging trends in consumer treatment technologies, explore the new digital treatment options, and discuss how executives of provider organizations can incorporate new technologies into their strategy. The agenda will include case study presentations from organizations that have successfully incorporated consumer and technologies into their programing. The speakers will discuss how they have incorporated technology into their program model; how technology has shaped their staffing and operations; the impact that technology has had on their relationships with consumers; and the effect that technology has had on their clinical and financial performance. The summit will conclude with town hall discussion, where attendees will have a chance to talk with the presenters, ask questions about their use of technology, and discuss their perspective on the future of digital consumer engagement. Registration for this one-of-a-kind program is limited to 100 executives. Any executive purchasing an All-Access Institute Pass to The 2019 OPEN MINDS Strategy & Innovation Institute has access to this summit. Individual registrations for the summit are available for $300. 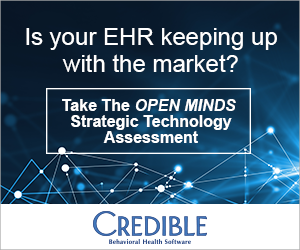 Learn more about registration options at https://strategy.openminds.com/register/. This year’s summit will take place one day after The 2019 OPEN MINDS Strategy & Innovation Institute. The institute will return to the Sheraton New Orleans Hotel and will focus on strategy tools executives need for success in a market dominated by value-based reimbursement.